Expanding your city by clearing blocks using “hypnotons” is probably the best way to add more space, so that you can construct more buildings. But you will need lots of hypnotons to clear blocks. You will have to earn and save them to clear hypnowaves. Until then, why don’t you put unwanted structures in your inventory? Don’t remove buildings as they earn bucks and EXP, but you can surely get rid of decorations if you want extra space for placing important buildings. Long-press a decoration until three tabs appears under it. Now tap the middle tab to store an unwanted deco in your inventory. Don’t worry! You can always put things back in their proper place once you have expanded your city. All you need to do is tap the settings button (gear icon) on the bottom of the screen and then tap “Inventory”. 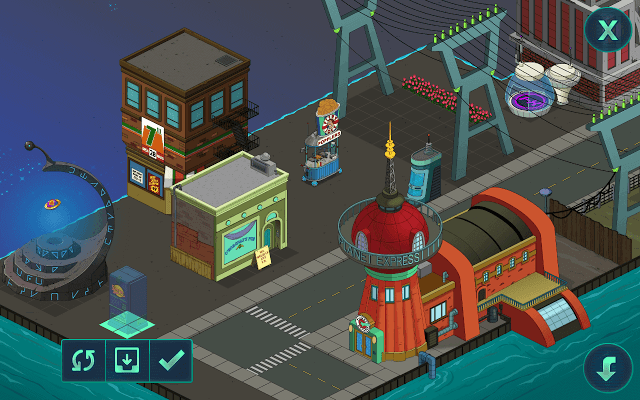 Now tap the down arrow button on the lower right corner of the screen and tap the deco to place it back on your city. Long-pressing any structure also lets you move a building to the desired location and rotate it. You may have noticed that each character has a unique class. If you haven’t, then just tap the characters button at the lower-right corner of the screen (located just next to the shop button) and then tap a character’s profile icon. The name of the character and his class can be seen just above him/her. For example: Amy’s Class is “Scientist”, whereas Bender belongs to the “Robot” class. Each class has a different background color – Robot (Blue), Scientist (Red) etc. 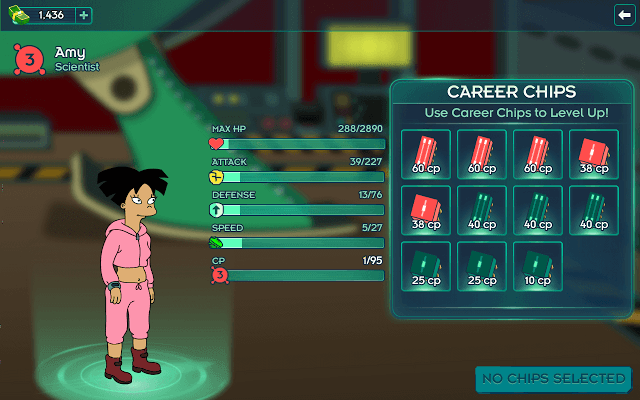 To level up a character, you will need career chips. If you want to level up a character faster, then start using those career chips that have the same color. Such career chips can be earned by completing space missions. For example: First time rewards for finishing the “Cowboys in Space Mission” are 3 robot chips and 3 mega science chips. Mega career chips that belong to the same class give more EXP than common chips. You can level up your character faster by using only a few of these mega chips, plus all character attributes will also increase when your character levels up. Futurama: Worlds of Tomorrow has a unique battle system that allows players to get critical hits and defend their characters. To get a critical hit, a player needs to tap the screen when the circle underneath an enemy is full. To defend, the player has to tap the screen when the circle underneath a character is full. You truly are a champ if you can get a critical hit and quickly defend your character when it’s your enemy’s turn. But many times, it won’t be possible to defend as enemies will be quick to hit back. If you have just started playing, then you should concentrate more on getting critical hits as a critical hit can reduce an enemy’s HP considerably and he will be eliminated faster. 1. Complete actions to get XP. Completing a set of actions finishes a goal (you can see a list of actions under a goal by tapping it. Goals can be found at the lower left corner of the screen). Completing goals will earn you more XP. 2. Finishing space missions is another way to earn experience points. Look for goals that ask you to complete space missions. This way, you will earn rewards from both space missions and from completing that goal. 3. You also earn EXP when you win a turn-based battle. Try to win a battle without losing a character to get more EXP. 4. In dialogue-based missions, good dialogue choices also earn you XP and other rewards. 5. You also receive one-time EXPs when you place decorations and buildings on your city. Buildings keep earning EXP and bucks every few hours so don’t forget to tap each building to collect them. Explore the entire planet in a space mission and complete all stages to get 5 pizza slices. Many times, you will need a certain character to unlock an area in a planet. You can’t explore a planet fully if you don’t take the required character. You will get 5 pizza slices after achieving 100 percent completion. Watching a video is also one way to get a free pizza slice. Tap the large television floating above the sea to watch a video. Buildings are one of the best ways of earning the much-needed Nixonbucks and XP. Tap the shop icon at the lower-right corner of the screen. Now tap the “Buildings” tab in the middle. You will see a host of futuristic buildings. Each building earns a certain amount of XP and Nixonbucks, but the construction time varies from one building to another. For example: The Hip Joint earns 35 EXP and 55 bucks every 4 hours and its build time is 3 hours. Buildings will be part of some goals, so keep an eye on each goal and complete those that involve constructing buildings. Example: Amy’s “Classing up the Joint Pt. 3” goal has two tasks and one of them is building the Hip Joint. Bucks and XP will be displayed above completed structures. You just have to tap a building to collect them.